With “one small step for man, one giant leap for mankind,” get a deeper understanding of the moon with these resources for a unit study about The Moon. You and your family will build a model lunar settlement that provides all the necessities for healthy and happy human inhabitants. On Jan. 2, 2019, China made history with the first-ever soft landing on the far side of the moon. Find info, pictures, and video of this historic event. One of the largest and newest craters on the moon. It is a bit south of Mare Imbrium (if you look at a full moon at midnight, it is the bright white spot a little left of center). 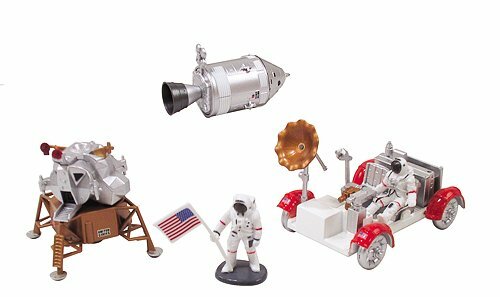 Construct and use for a diorama of Neil Armstrong and the first moon landing. Does require a fine screwdriver such as might be found in an eyeglass repair kit. Small parts can be easy to lose, so open over a food storage container. A large, interactive site, that will take you hours to explore. A collision on Friday, October 16, 2009. NASA scientists in Mountain View were trying to learn if there is water on the moon by crashing an unmanned spaceship onto the lunar surface. The collision sent up a 40-mile high cloud of debris. Neil Armstrong was the leader of mankind’s first mission to the moon, and the first to set foot on its surface. His words, “That’s one small step for man… One giant leap for mankind,” are now world famous. Apollo 11 photograph of the footprint of astronaut Neil Armstrong, the first man to walk on the Moon, imprinted in the lunar surface. The Apollo 11 Lunar Module, carrying Neil Armstrong and Edwin ‘Buzz’ Aldrin, performed the historic lunar landing on 20 July, 1969. Written by G. Jeffrey Taylor, Hawai’i Institute of Geophysics and Planetology. Illustrated with computer simulations. 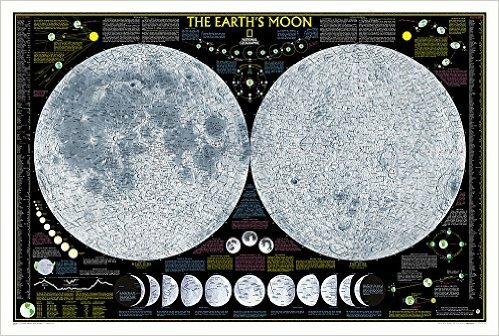 This incredibly informative wall map features detailed depictions of the entire surface of the moon with a selective index showing the named physical features. Diagrams show the moon’s orbital paths, rotation around Earth, librations, how solar and lunar eclipses occur, and how the moon affects Earth’s tides. The phases of the moon are detailed along with the features visible in each phase. Craters, mountain ranges, highlands, seas, rays, and other physical features are described, as are the moon’s physical properties, moon lore, and more. Build a rubber band-powered rover that can scramble across the room in this activity from Design Squad Nation. To The Moon | How Do You Get to the Moon? During the Apollo 11 mission, Neil Armstrong became the first human to set foot on the Moon. This video, adapted from NOVA, details the three competing mission plans considered for landing a manned spacecraft on the lunar surface and focuses on how the Moon’s low-gravity conditions and lack of atmosphere influenced the design and manufacture of the landing craft.